If I’ve learned anything lately, it’s that cabbage salads are delicious, cabbages are huge, and they last forever. 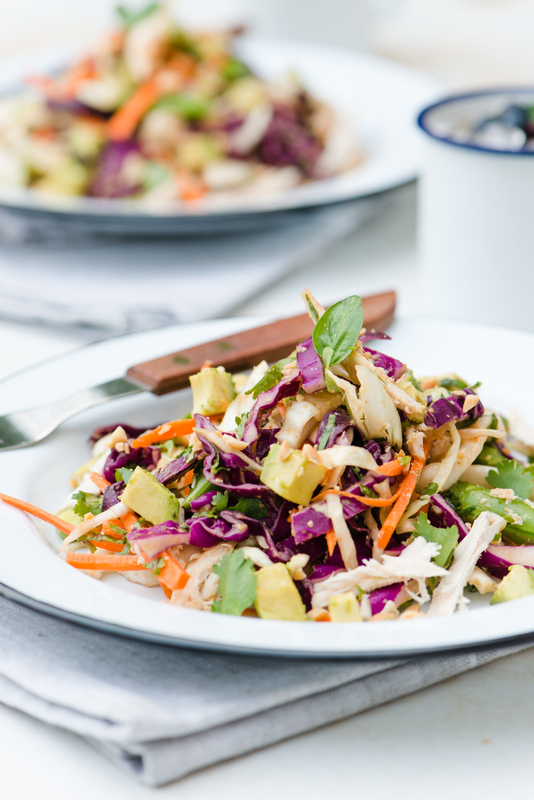 Ever since making this salad, Shannon and I have been trying to figure out how we can possibly use up all of our leftover cabbage. 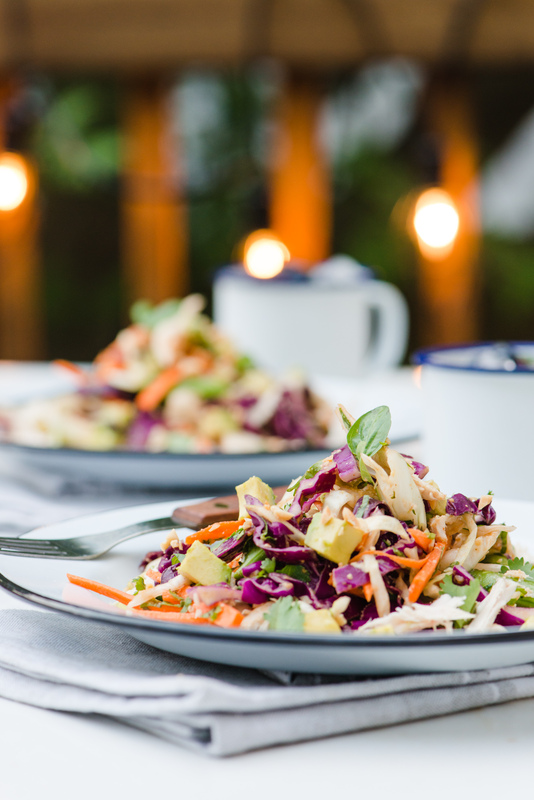 In what developed into a never-ending journey of Pinteresting “Cabbage”, we came across this delicious looking Asian inspired cabbage salad. I think my favourite thing about cabbage, is just how hearty of a vegetable it is. After adding some roast chicken and making a few other modifications, we were left with a very satisfying dinner. This salad must have been giving off some good vibes, because just as we finished making it, we received an unexpected visit from Shannon’s friend Brooke. Fortunately the recipe made plenty of salad, so we plated up a third dish, mixed up some Blueberry Juleps, and enjoyed dinner and some company on our deck! 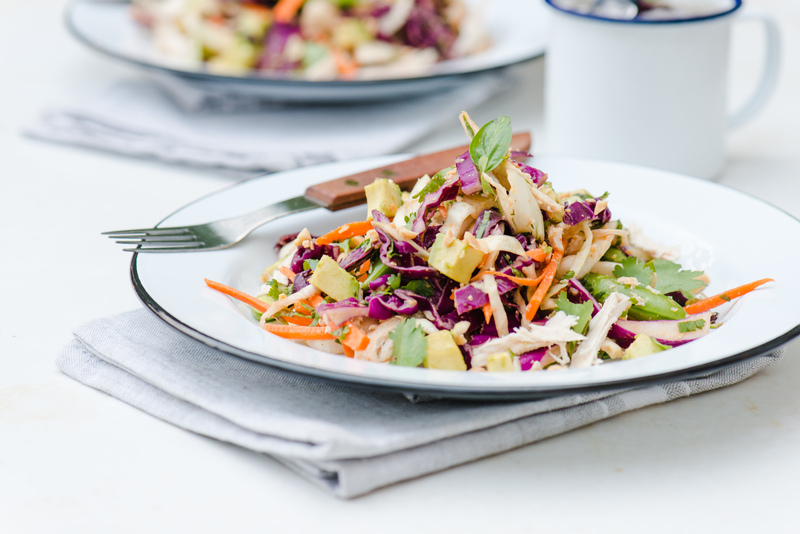 Fresh, crunchy vegetables, topped with an Asian inspired spicy peanut dressing. Remove chicken breast from fridge at least 30 minutes prior to cooking, allowing it to come to room temperature. In a pan on medium heat, add about a tablespoon of olive oil. Once heated, add chicken breast, seasoning to taste with salt & pepper, cover with a lid, cooking for about 5-7 minutes on each side, until fully cooked. Let chicken rest 5 minutes, then shred with a fork. Whisk together dressing with a fork, dressing your salad to taste. After this salad, I think Shannon and I may have to start taking dinner reservations at our house!